The following series of photos and articles refer to the amazing Argentine Tango Duo, Milena Plebs and Ezequiel Farfaro, who have been wisely sponsored in workshops and performances by Danel and Maria of Bailemos Tango. 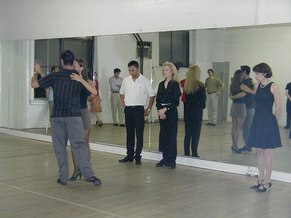 The photos were taken at Workshops in Advanced Milonga and Advanced Tango on Monday, July 22, 2002. Milena and Ezequiel are charming and articulate, as well as superb Tango Performers. 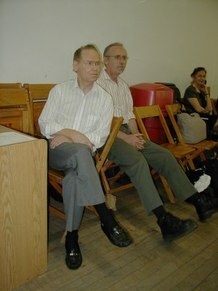 They perfectly partner each other, often in unique syncopation and choreography. 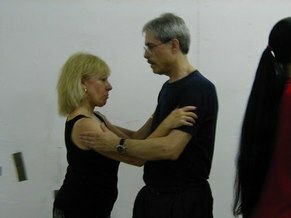 They were a joy to observe, both in performance at Saturday, July 20, Bailemos Tango's Milonga, at Pierre Dulaine, and at the July 22 Workshop. 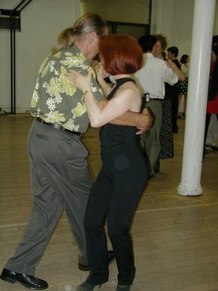 They also present workshops tonight in Tango and Milonga. Kudos to Danel and Maria for having the foresight to sponsor Milena and Ezequiel. Milena Plebs - Regisseur, Choreographer and Dancer. She studied Ballet, contemporary dance, choreography, acting and rhythm. She was part of the "Contemporary Dance Group" of the Teatro Municipal General San Martin, in Buenos Aires, for six years. She was part of the famous production "Tango Argentino" staged by Claudio Segovia and Hector Orezzolli . Milena Plebs and Miguel Angel Zotto created the "Tango X 2 Company" , the group that has changed the conception of Tango shows , of which they both were choreographers, directors and principal dancers of their shows "Tango X 2", "Perfumes de Tango" and "Una Noche de Tango". She herself created and choreographed the show "Romance de Barrio"
Milena appeared in the films "Tango Bayle Nuestro" directed by Jorge Zananda, "Tango" a documentary by the National Geographic Society, USA, presented by Robert Duvall, "An Oratory to Carlos Gardel" by Horacio Salgan and Horacio Ferrer and "Flop" directed by Eduardo Mignogna. During her career, she has received three very important awards, the "Maria Ruanova Award", in 1991, the highest Argentine dance award, the "Trinidad Guevara Theatre Award", for the choreography of her production "Perfumes de Tango", in 1997 and the "Gino Tani Dance Award" in Italy, in 1998. 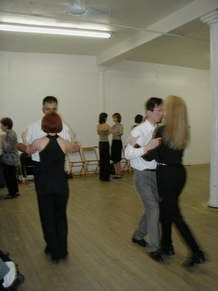 She gave seminars on tango teaching during her many tours and took part in many tango congresses in "Northwestern University", Illinois, USA and "Santa Fe Tango Retreat" in Santa Fe, New Mexico, USA . 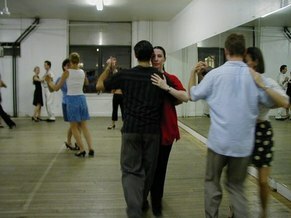 During 2000 she began dancing with Ezequiel Farfaro . Together they appeared at the "Fifth World Tango Summit" in Rosario, Argentina and several homages to Carlos Gardel in Buenos Aires , and the photo show "Milena del Sur" by Alejandra Quiroz . Milena Plebs is a member of the "Academia Nacional del Tango", "Asociación La Reina del Plata" and she is the patroness of the Carlos Gardel Monument in Abasto District, in Buenos Aires. Ezequiel Farfaro - Actor and dancer. He studied at the "Escuela Nacional de Arte Dramatico" (National School of Drama) and has studied tango and Argentine Folklore, mime, clown, singing, cinema and TV. He took part as an actor in many plays and was part of the "Mimic Company Theatre" directed by Roberto Escobar and Igon Lerchundi, performing in Argentina and different Theatre Festivals in Brazil, France and Giorgia. 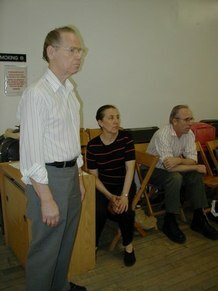 Ezequiel Farfaro was part of the "Company of Popular Dancing" from the "Escuela Nacional de Arte Dramático"
Tango teaching in Japan for a year, in Brazil and at the "Club Almagro de Buenos Aires", among others. 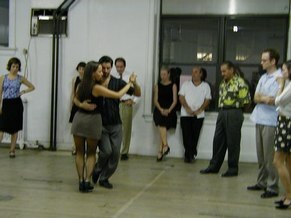 In 2000, Ezequiel started partnering Milena Plebs in Tango . 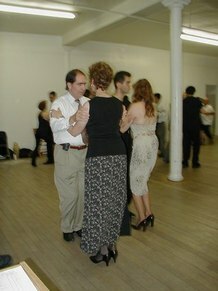 They appeared in the inauguration of the First Monument to Carlos Gardel in Buenos Aires , in several Tango events and in the "Fifth World Tango Summit" in Rosario, Argentina , the 10th Aniversary Gala for "Academia Nacional del Tango" and paying homage to Gardel, the best Argentine Tango singer, in the Abasto, performing "Vestido de Fiesta".